Nation's Oldest Female Veteran Dies At 108 : The Two-Way Lucy Coffey joined the Women's Army Auxiliary Corps two years after Japan attacked Pearl Harbor. President Obama and Vice President Biden visit with Lucy Coffey in the Vice President's Office of the White House on July 25, 2014. Updated at 2:30 p.m. ET. 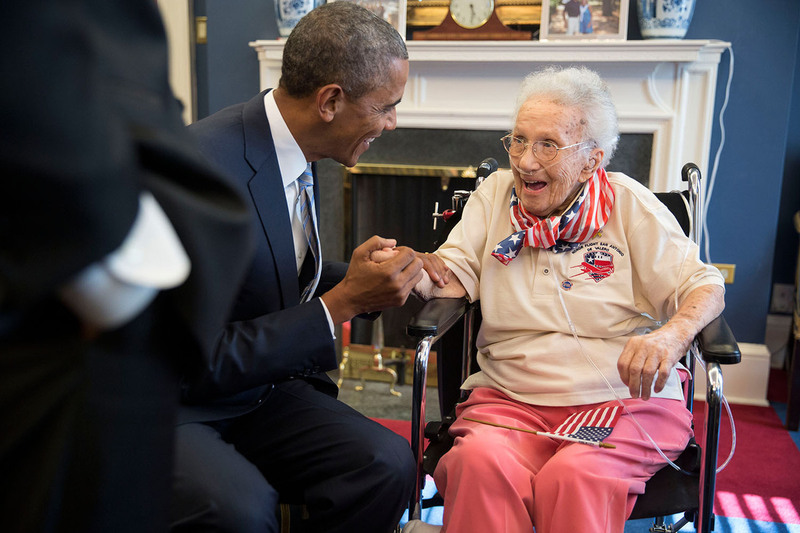 Lucy Coffey, the nation's oldest female military veteran, has died at the age of 108. She died Thursday in her sleep at her home in San Antonio, Texas. Her friend, Queta Marquez, a veterans' service officer, says Coffey had been sick for about a week and had a chronic cough, according to CBS. Coffey was working at an A&P grocery store in Dallas when Japan attacked Pearl Harbor, according to the Stars and Stripes. In 1943, she joined the newly formed Women's Army Auxiliary Corps. The war took her to the Pacific theater, including New Guinea, the Philippines and finally Japan, where she spent a decade before moving to San Antonio. President Obama issued a statement Friday on her passing, noting that Coffey earned two bronze stars and that "the example set by her and her fellow WACs has inspired generations of patriots since." Last year, other veterans in Texas organized a so-called Honor Flight for Coffey that brought her to Washington, D.C., to see the area's war memorials. During that trip, Coffey met President Obama and Vice President Biden. In Friday's statement, Obama said it was an honor meeting Coffey and that "it was clear that the passage of time never dampened her patriotic love of country or her pioneering spirit." Only one other veteran — another Texan, named Richard Overton — was older than Coffey ... by just three days.